I had a ‘head meets heart’ moment today when they brought four new children into the baby home. In our three weeks here, we had not been in the building when new children had arrived. Though I knew in my head, that obviously all the children living at the baby home had to have been turned over by their families at some point, I had not seen it happen. And like most things we see or read about in the news (extreme poverty, disaster stricken countries, etc. ), you think you can understand what that means, until you see it with your own eyes. The four children brought in today had all been abandoned at a local hospital, and were of varying ages. One little boy was given to my sister and I to look after while they evaluated the other babies. He was small, my guess would be between 2 – 3 years old, and he was TERRIFIED- and why wouldn’t he be? We had funny white faces, spoke a language he didn’t understand, and were in a brand new place where he didn’t know anyone. I sat there with tears rolling down my cheeks as I tried to help distract him with toys and songs, but couldn’t stop my brain from wandering. I thought about how maybe only hours earlier, someone in his life had looked at his sweet little face, and CHOSE to leave him in a hospital waiting room, knowing that they would most likely never see him again. Maybe that person had actually saved him from abuse that was being inflicted by another family member or someone else. I don’t know the story, and maybe they won’t ever know the full story. My heart broke as we sat there with him, doing what we could to outwardly show love to him, as the language barrier prevented us from speaking with him. As we sat there, I couldn’t help thinking about my own 2 year old back at home, which made the tears come even faster. Then that head meets heart moment came when I thought, “But… thank you, God, for Watoto.” This child will be raised in a community that can provide for him in ways that, perhaps, his own family could not. He will have food to eat on a regular basis. He will have a family he can call his own. He will be able to attend school. He will be taught about Jesus, who loves us far more than any earthly parent ever could. 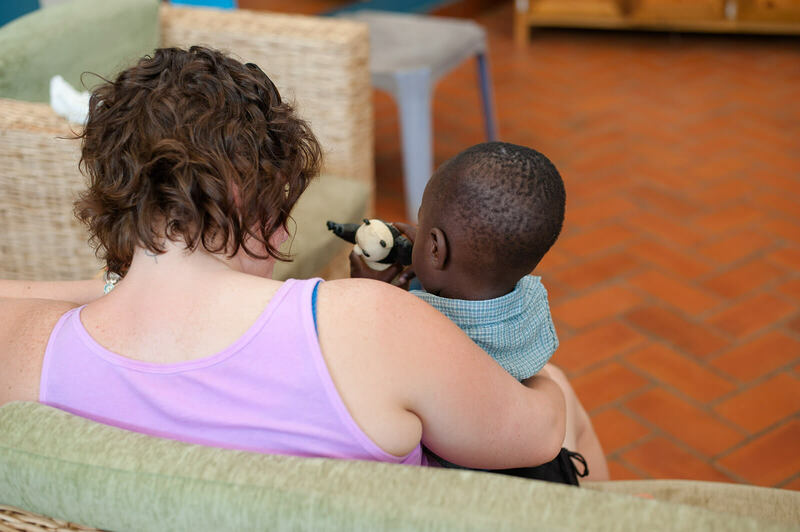 I cannot, and should not, judge the circumstances under which this little guy came to Watoto- but instead be thankful that I know he will be well cared for in the very capable and loving hands of the staff and volunteers at the Bulrushes baby home, and eventually a Watoto village. It is a very hard thing for my mother’s heart to understand, but at the same time, I am thankful that there are organizations like Watoto that exist to provide for these children whose families know they cannot provide them the care they need. Thank you, God, for Watoto.